Of all recipes tagged with Abby’s post-its, naturally, I honed in on what looks the most manageable for a weeknight dinner. It’s pork, it’s apples, and you know it’s going to be good. Deb was nice enough to let us run it below. PS: I’m giving away one free copy of The Smitten Kitchen Cookbook to a commenter selected at random. Winner announced Thursday morning (and must live in the 48 contiguous states). Good luck! Update: Megan (#26) is the lucky winner. Thanks everyone and look out for some more giveaways as we head into the holidays. Whisk the glaze ingredients together in a small dish, and set aside. Trim any excess fat around chops until it is but a thin ribbon, no more than 1/8 inch thick. Pat chops dry with a paper towel, and generously season with salt and pepper. Heat oil in a heavy 12-inch skillet over medium-high heat until the oil starts to smoke. Add the pork chops to the skillet, and cook them until they are well browned, about 3 minutes. Turn the chops, and cook 1 minute longer; then transfer chops to a plate and pour off any fat in skillet. Pour glaze mixture into the emptied skillet. Bring it to a simmer, and cook until mixture thickens enough so your spatula leaves a trail when scraped across the pan, about 2 to 4 minutes. Return the chops and any accumulated juices from their plate to skillet; turn to coat both sides with glaze. Cook them over medium heat in the glaze until the center of the chops registers 140°F on an instant-read thermometer, about 5 minutes. Adjust seasonings to taste. Transfer the chops to a serving platter and pour the glaze from the pan over them. Sprinkle with dill, and eat immediately. Pork chop photo by Deb Perelman. I would love to try out this beautiful cookbook! Mmmm. Pork chops. Haven’t had those in forever! I love Smitten Kitchen, the blog, so I know this cookbook will be fabulous! Yay! This is on my Amazon wishlist right now. Deb is one of the few bloggers (along with you guys) who we know we can trust. For days when I have a few extra minutes for making a fancy dinner, I’d love this cookbook! I’ve been eyeing that cookbook! Would love to win. 🙂 Thanks for the opportunity! I am waiting for a copy to come in from the library! Thanks for the opportunity! I’ve been reading Debs blog for many years. Her recipes definitely deliver . And I too think her photos are amazing. Thanks for the pork recipe. Yours is a warm and generous post. Perhaps you might consider sharing your views on the new Gather Journal as well? It’s a very different model for food writing, and somewhat off putting because of it’s price, but includes some good ideas and wonderful photographs. Gonna buy this anyway, but would love an extra copy to give to my sister-in-law for the holidays! I love how all the food blog world is connected! The pork chops look amazing and I can’t wait to see that cookbook in person, one way or another. I’ve always loved the Smitten Kitchen too! I definitely plan on buying your cookbook for myself, but the SK cookbook would be a nice treat as well! DALS and Smitten are the first two food blogs I check when I open Google Reader. You and Deb have introduced our family to new flavors and given us some great kitchen adventures. We would put her book to good use alongside yours. I love the Smitten Kitchen blog and can’t wait to look through the cookbook! Thanks for the giveaway! I am going to see Deb speak tonight in Brookline (she’s following in your footsteps! ), so this post is good timing 🙂 I am glad you gave this recipe a test run – now I will be more likely to make it. I would love to try this cookbook out! It’s on my Christmas wish list! Both the book and the pork chops look amazing! Wonderful! I was so excited when I first saw this cookbook, and I’m hoping that it enters our house this Christmas. All I have to say is yum. I love Smitten Kitchen! Deb’s is definitely one of my go-to blogs for dessert recipes (and adorable toddler pictures). Thanks for hosting the giveaway! Would love a copy of the book. Looks yummy. Thank you so much for offering a free copy! I’m a huge fan of both yours and Deb’s. Her blog was my gateway into discovering so many wonderful cooking blogs and I’m happy to see you’re both receiving much success with your books. You deserve it! Looks really good and easy to make! I love Smitten Kitchen! Thanks for sharing this recipe! Yum! Is it officially Abby approved? I always forget how quick pork chops are to cook until I cook them and wonder why I don’t do it more often. Would love to have the SK cookbook! I have been drooling at her photos for over a year now! I would love this book! My two go-to websites when I’m out of dinner ideas are yours and Smitten Kitchen! I’ve picked up a few new cookbooks this year(including DALS, of course!) and Smitten Kitchen would be a great addition to my collection. 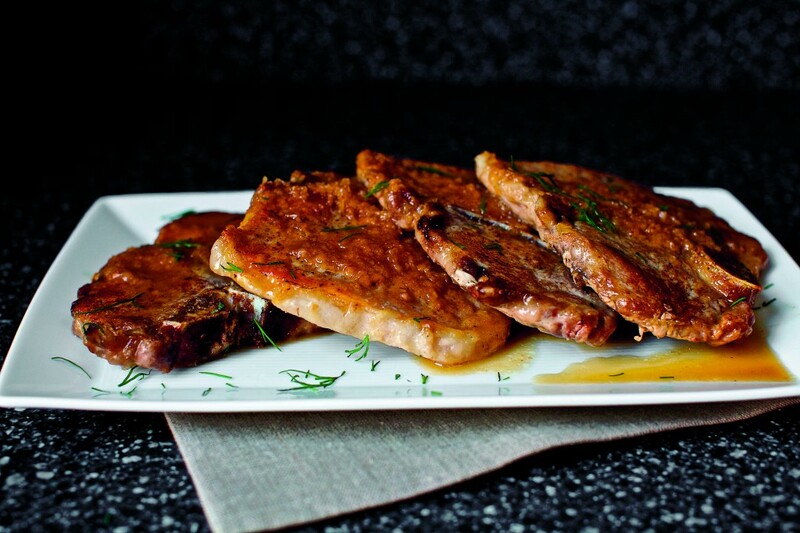 The pork chops look delicious… and I think the horseradish, cider, and dill sounds like an interesting and wonderful combination! Would love to try this recipe, and anything else in the book! this is the first thing we made in our house from her book! can’t wait to make everything else!!! Love Smitten Kitchen! Deb’s recipes always earn rave reviews when used. I love the Smitten Kitchen blog and can’t wait to read her cookbook!! I would love a copy of Smitten Kitchen! I’m almost done with your book, and I love it!! I’ve already made several things, and they were a big hit! I am a huge Smitten Kitchen fan. I have made tons and tons from her blog. Having no power and then heat for almost a week in the aftermath of the storm we spent tons of time at the bookstore keeping warm and killing time. I got to look through the book at length. I have the book on my wish list. I have been dying to try the popcorn cookies. Yum, those sound delish. DALS vinegar-y pork chops have made it into our rotation so I will give these a try, too. i already have a copy but would love an extra to give away for xmas! I’ve already put so many cookbooks on my Christmas wish list this year, I’m going to buy this one for my mom. She will do it proud. I can’t wait to see it in person! This book is on my Christmas list! Love her website. I love Deb’s blog so much – I’d love to win her book! All my cookbooks look like that when I first bring them home! I would love smitten kitchen’s new book! I did get Sam Sifton’s Thanksgiving at your suggestion and love it dearly. Thank you. What a great idea–can’t wait to give Deb’s cookbook to my kids to choose from! Love DALS. Love Smitten Kitchen. Thanks for the give away opportunity. Smitten Kitchen was my first ever food blog – and because of Deb I’ve found so many more glorious resources! Looking good, indeed! Would love to have this book, I know it would energize a long winter of cooking for my family. I would love this cookbook and you’ve inspired me to hand a cookbook to my son and do the same thing that you’ve done with your daughter! This is one benefit of a hard copy book that browsing recipes on the web can’t do quite as well. He could leave a browser window open for me, but I don’t think it has the same effect as a post-it on a physical page in a book. Can’t wait to see the popcorn cookie recipe! Thank you for offering this giveaway! I love your blog Jenny. Your cookbook is my go to cookbook. I plan to make the Meixcan Chocolate cookies for my annual family cookie bake. You rank right up there with my other favorite, Ina Garten. Thanks! I love the SK blog. I am so excited that Deb finished her book! I am hoping to get it for Christmas – I bought 2 for Christmas presents but want “Santa” to gift me my own copy. Maybe this will be my early Christmas gift! The chicken with grapes and olives (I know you don’t like them) is the best weeknight dinner. You must try it! Having your kid pick out recipes from a new, beautiful cookbook = brilliant! Filing that one away for my someday-with-kids files! I’m a huge fan of Smitten Kitchen, and the recipe you featured, (pork, cider, dill, horseradish? Yes, please!) sounds amazing! Everything from smitten kitchen looks so good. Your blog and Smitten Kitchen’s are the two I turn to most often – would love a copy of this book! Yum! Looks amazing. We will try them later this week! i love deb and smitten kitchen. so excited for her book. i’ll have to give these chops a whirl next week. thanks for sharing. The Smitten Kitchen cookbook looks fabulous! I’d love to win this. deb is such an inspiration!! WOW. Those chops are going on my next meal plan. Thanks for the opportunity to check out the whole cookbook! I adore Smitten Kitchen. If you haven’t tried Deb’s caesar salad deviled eggs, you must. They are a beautiful, delicious party hit! I asked Santa for this book, I can’t wait to get it! I asked for this for Christmas and it has taken all my will power not to order it before then. I did the cinnamon French toast off her blog and it was amazing and easy. My three year old twins loved it. Yay! I love her blog, and I’d love to have her cookbook! 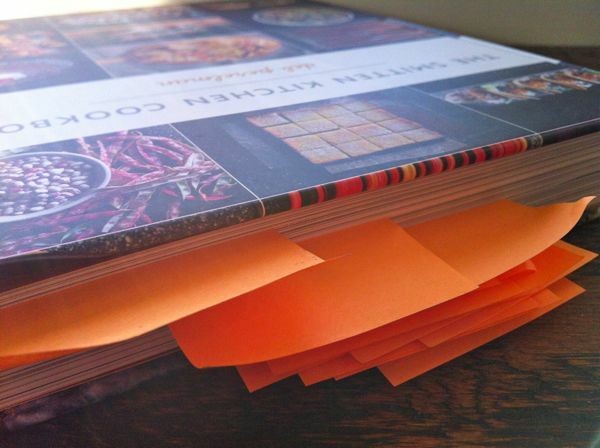 One of the Christmas gifts I am most looking forward to giving to my girl is a cookbook wrapped with post-it notes so she can do this very thing! This would be lovely treat. Pick me! I’m dying to get a copy of her book! What I love about Smitten Kitchen (and your recipes as well) is that the recipies are always delicious and perfectly attainable! They never (or very rarely) contain an ingredient that I can’t access in my small town and I’m never faced with a technique that I’m not confident that I could master (or wing–at best). This cookbook is on my wishlist! I’ve been following Deb for years; can’t wait to read through this book! Impressive photos, and enticing, too! You both know how to narrate a recipe post so well. This is on my wish list for Christmas. Love Smitten Kitchen! I’ve been following Deb’s blog for a long time – I’d love to win a copy of her book! Smitten Kitchen is on my Christmas wishlist! You’re just like Santa!!! This is on my Christmas list this year. Thanks for the great giveaway! Would love this cookbook, Smitten Kitchen is one of the first food blogs I started reading and still one of my favorites! Would love to add this beautiful cookbook to my collection! Would love to have this book. I added your book to my cookbook collection this year. To add another awesome cookbook would be even more awesome! Smitten Kitchen’s peanut butter cookie recipe is the favorite in our home! It’s on my wish list! Would love to win it! I’m so excited about this cookbook! I’ve already decided to give at least one as a holiday gift (along with your book), but I’d love a copy for myself as well! Those pork chops look good! Much better than the dry ones I ate yesterday!! I love Smitten kitchen and have been eyeing this cookbook since it came out! I’ve been giving Deb’s cookbook (and yours, of course!) as gifts for the past few months and have yet to buy Deb’s for myself. Her apple cake is one of my very favorites ever. I would love to start cooking from this book! I found Smitten Kitchen because of DALS (thank you) – I’m happy to have so much dinner inspiration in my life! ooh! This cookbook sounds simply wonderful! Oh man! This cookbook would make my life so much tastier! This is the second time today I’ve heard/read someone talking about this cookbook. I’ve never been to this lady’s blog before but I’m going right now and checking it out and probably subscribing. I’d love to have the cookbook. I may just have to put it on my Amazon wishlist. have been hearing such great things about this book – might have to pick it up! I love Smitten Kitchen! Every recipe that I’ve tried from the blog has been a hit! I’ve been wanting to order this book for awhile- if I don’t win it- I may just have to buy it! Would love to win a copy, because I’m with Abby — I love Deb’s desserts! Have been eyeing this cookbook and would LOVE to win it!!! To say I would love love love love love to win this book would be a huge understatement! Oh the excitement! I love Deb! And DALS! And food! I would love to win this book! Love Smitten Kitchen. This book is at the top of my wish list! I would LOVE LOVE LOVE to win! Thank you! I would love to add this book to my collection. Loved your cookbook, would love to win this one as well!!! I’ve been reading Deb for years. Our boys are just days apart, so I especially love the Jacob photos! Smitten Kitchen is one of my favorite food blogs! I would love to win the cookbook too! I’ve been dying to take a look at this book–thanks for the giveaway! Would love to win this! Love Deb. LOVE her. I would love to have this cookbook in my collection. I love her recipes. Just made Roasted Pear and Chocolate Chip Scones this morning! You and SmittenKitchen are the only two foodblogs I follow! Of course except for mine…but I’ve never told anyone it exists and hope no one finds it. But at least it’s a repository of my favorite recipes. I found my favorite muffin recipe at Smitten Kitchen, I would love this book! I would love to have this book in my kitchen. Just looking at her photos on her blog gives me the incentive to cook or bake that particular meal or dessert. That cookbook is on my Christmas wish list. I love the pork chop recipe that you’ve chosen to highlight — easy enough for dinner tonight! And what a great idea to have the kids pick what they want to eat. Crossing my fingers that I’ll win. Would love to try out this cookbook! This one is on my Christmas list! I’d love to win this. Love her blog! I’ve been looking forward to reading this book too! I would LOVE to have a copy of The Smitten Kitchen Cookbook! You and Deb are my favorite food blogs to follow! I would love to win a cookbook! Those chops do sound delicious. Might be my dinner today – thanks! I have this book on my Christmas wish list – I’ll be buying it in the new year if I’m not lucky enough to find a copy under the tree! those apple cider caramels are the bomb. seriously one of the best things i have ever made, ever. Would love to dig into Deb’s new cookbook! Smitten Kitchen is on my Christmas list…don’t know if I can wait that long. what a great giveaway. i’m always looking for some new kitchen inspiration! happy holidays! Wow! This is now on my menu for next week! And this cookbook has been on my wishlist…pick me, pick me!!! Gosh, I love Smitten Kitchen. Great description of Deb’s cooking style too. I soooo want this cookbook! I have been awaiting it’s arrival since its early days. So exciting!!! 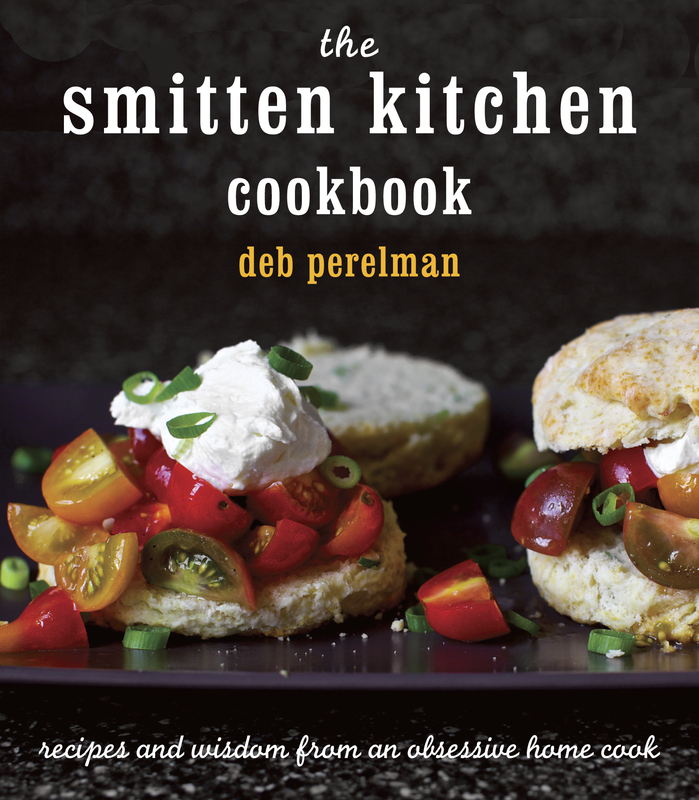 I love SMITTEN KITCHEN…would love a copy of her new cookbook!! Such a great idea, having your daughter pick recipes! I love when my favorite food blogs collide! I usually plan my menus around the Smitten Kitchen archives. Would love to add this “must have” to my carefully curated collection of cookbooks! Ooooh! I LOVE Smitten Kitchen and would love a copy of the cookbook. Thanks for the giveaway. Yes please! Deb’s photography is amazing. Love Smitten Kitchen and I pre-ordered the book from Amazon. Unfortunately, it arrived simultaneously with Sandy. For the time being we have place to cook due to storm damage, but I will use Abby’s method to mark my favorites in anticipation of the unveiling of our brand spanking new kitchen! The pork chops look like a keeper, for sure. No surprise really that both your websites are bookmarked next to each other then. We have had DALS for about 4 months and only made a few dishes so far, but it is so inspiring! Oooh, I would love this book! DALS and Smitten Kitchen are the two food blogs that I can’t live without! I was at the bookstore looking for a cookbook to give as a bridal shower present. That is when I saw your book and Smitten Kitchen. After perusing many cookbooks for my young friend I had to get something for myself. I whittled all the the books down to yours and Smitten Kitchen. Something about yours just called to me so I went with that one. I just finished your book. I read it cover to cover like a novel. I can’t wait to start cooking your tasty recipes. And it would be so awesome to get Smitten Kitchen. Two of my favorite blogs! Pick me pick me! This book is definitely on my wish list. I made the apple cider caramels as a Thanksgiving hostess gift, and they were a big hit. When going through a cookbook myself, many times the pictures dictate what I try first as well! Those look delish. Deb is here in Boston tonight and I’m home sick with a cold! I’m so sad I’ll miss meeting her. Think she could be convinced to drop by and make me some soup? Looks delicious – cider and pork are perfect together. I’ve asked Santa for the cookbook already but afraid he might not deliver. Pick me! Thank you Jenny for introducing me to Smitten Kitchen! I learned about Deb here first and am so happy to visit both of your sites. I am inspired in so many ways by both of you as a working parent trying to make the dinner thing happen. I love her blog! Would love the cookbook. I’m on the list at the library for it. I’ve been coveting this book since before it came out but just can’t buy things for myself right now. I LOVE smitten kitchen. Ok, I’d been resisting getting Deb’s book, but that was before I knew about the Buttered Popcorn Cookies. Now I need it! What a brilliant idea to have the kidlet pick something out to eat! Why haven’t I thought of that before? I’ve had great success with recipes from Smitten Kitchen. Thanks for the chance to win her cookbook! Jenny, I was just given your cookbook and wow! It is changing our family in a great way…and I haven’t cooked one of your recipes! I have read about the Smitten Kitchen and it is in my wish list! mmm.. this sound delicious – i love your cookbook, (even sent it off last week as a baby shower gift!) and Deb’s book is on my wish list! My two favorite food bloggers, together in one post! Yay! Would love a copy! Wait, popcorn COOKIES? I’m definitely going to have to get my hands on this one. 🙂 Thanks for the giveaway opportunity! oh my goodness that looks good…i was hoping to see this under my tree this year and maybe let my family listen to all my ohmygoodnesses while i flag pages in the next room! would love a copy of this! I somehow randomly have all of these ingredients in my fridge right now (minus the dill – but a quick stop at the Grand Central Market will fix that). Guess I know what my family will be having for dinner tonight! I’m dying to get this book. Her Seven Layer Cookies (aka, rainbow cookies) are the absolute best! This looks great. And I love Deb’s blog. Haven’t bought her cook book yet though. DALS and Smitten Kitchen are both on my Christmas wish list! Great post today. I actually bought DALS when I went into the store to get Deb’s book (it wasn’t out yet!) I feel so awesome that I found your cooking and we have Deb to thank! Would love to win the cookbook. I read both you and SK daily. Great giveaway! I love Smitten Kitchen–crossing my fingers! Smitten Kitchen is my other go to site for recipes. I have never had any of her recipes turn out anything but wonderful – would love to have her book! Love Smitten Kitchen and can’t wait to check out her cookbook (or win one!). I’ve been waiting for this book to be purchased by my local library, but winning a copy would be even better! i made this recipe last night for dinner – it came together so quickly and went so well with some roasted brussel sprouts. the book will definitely get a lot of use in my kitchen! I have tried several recipes from her website and they are always delicious! I want this book so bad, but we’re on a spending hiatus. Fingers crossed! Love the SK blg and Deb! p.s. i’d skip the dill but all of the other ingredients sound like great additions to the simple porkchop. What a coincidence – I have porkchops defrosting right this minute. I think it’s a sign that I need to use this recipe. And I love Smitten Kitchen! Fingers crossed! the Smitten Kitchen cookbook is on my Christmas list!! I would love to win this. I’ve been drooling over her blog for ages… that book seems dreamy. Ooooo I would love to win a copy of this!! Thanks!! Ohhhh! This is at the top of my wishlist right now. This would make my week!! I’m eagerly awaiting this one from the library but it’s going to be months (I am not the only one eagerly awaiting)! This is on my wish list at Amazon….. It sounds like Abby and I have kindred tastes! i would love to win this! those easy go to meals are great once in a while, but my family does appreciate the time that goes into a well prepared dinner. the middle child loves to bookmark recipes too… she just finished making pot pie crusts from scratch for dinner tonight. Sounds fabulous. I love the addition of horseradish! I hope I win – better odds than power ball , right? I love that you give such great reviews of other bloggers works! This sounds delish. I have been trolling the smitten kitchen website and considering buying the book–you have convinced me Jenny! I love the Smitten Kitchen website, I would love a copy of her book. Pick me! Pick me! I follow Deb’s blog *almost* as religiously as I follow yours! This dish looks awesome. I’m smitten! Deb’s recipes always deliver! Her blog is a favorite! I love your blog a great mix of my favorites food, books, etc… . I’ve never been disappointed by recipes here or on Smitten Kitchen. Favorites from the SK blog are the strawberry summer cake ( I’ve made it w/ many different fruits, the latest version being apples and fresh cranberries. I use all white whole wheat flour. )and blueberry yogurt multigrain pancakes. Thank you. Oh what a dream, like a library checkout without the fees. I love book giveaways. I gained the most respect for her after she made the homemade goldfish cracker recipe:) My girls love them. love the blog, very excited about the cookbook! Yay, pick me! Between your book and Deb’s, I’ll be all set! Apple cider caramels sound so delicious! DALS and SK are my go-to sites for inspiration! Deb’s recipe for pickled red onions pretty much changed my life. I make them year round and they make everything taste better. I’m so glad she has a book! I was just looking at purchasing this book last night! Smitten Kitchen is on my “check daily” list, along with DALS! Thanks for the opportunity to win the book! Oh man! I love her blog (ALMOST as much as yours), and her book is on my Christmas wish list!! I would LOVE to get this cookbook! Deb’s blueberry boy bait is so delish. I’ve been eyeing this in the stores. I am so excited for this book! It is on my Christmas list….I’ll keep my fingers crossed. Heard her speak on NPR and am so curious to see the book. Oooh, I hope I win! Thanks! Smitten Kitchen was my first food blog obsession, and lead me to many others (like DALS)! Would love to have a copy of the book! This book is on my Christmas list and I’m a frequent visitor to both DALS and Smitten Kitchen. You guys rock! I adore Deb’s recipes and haven’t gotten my hands on a copy of her book yet. I’d love to win it! Love SmittenKitchen! Would love to win a copy. I plan on buying one if I can’t. Deb’s peanut butter chocolate cake insanity has been my go-to dessert for birthday’s for my husband’s side of the family. They all love peanut butter & chocolate, and none of them like to stray too far into the un-known. Making that cake (with or without the ganache and brittle) allows me to have fun and fuss in the kitchen, and EVERYONE loves it. This cookbook is definitely going on my holiday wishlist! I just got it from the library yesterday – swoon! Deb does no wrong. I love Deb’s food and her writing. Her cookbook looks stunning! Looks like another great addition to our cookbook library!!! Thanks for the giveaway! Big fan of Deb’s and would love her cookbook! This cookbook is on my wish list for sure!! You do keep delicious company! You do keep delicious company! And your daughter has charming taste. I saw Deb on her book tour – she’s awesome. Her recipes rock! Wow. That looks good. But how can you feature a savory among all the wonderful sweets?! I just finished reading the DALS cookbook last week, which I loved, so I could use another cookbook to put on my nightstand! I was forced to return Deb’s book to the library yesterday, after drooling over it for 2 weeks! Love your blog and Smitten’s! I would love to have this book for my kitchen. Thanks for the giveaway! I was introduced to Deb by you! I have since fallen in love with her too and now DALS and Smitten Kitchen are my go-to bookmarks. Already have your book totally marked up (and voted for you on Good Reads! ), have given as a gift to a friend, and recommended it to countless others. Now eagerly awaiting my copy of Smitten Kitchen from Amazon – should be here Thursday (finally!). I had the same reaction that Abby did when looking through the cookbook, and I, too, tagged almost every recipe. I recently made the slow cooker black beans from The Smitten Kitchen Book and blended them into a delicious soup – perfect for a cool November evening. This cookbook looks gorgeous! I’d love to win it. Ooh, I would so love to get my hands on this cook book! Looks amazing! Do I win?? I’m completely smitten with your book already, and know I would be by Deb’s as well. Thanks for sharing!! That would be fantastic for my husband for Christmas! The first time I visited her website, I was immediately wary. Many, and I mean many, of her recipes just feel out of my league. But a few of them looked doable; all looked absolutely delicious. That being said, I’d love to try anything of hers. Perhaps her book is what I need to expand my repertoire. Would love to win the copy! Sounds like such a yummy glaze! I’d love the cookbook. Thanks. I’ve been looking for a great pork chop recipe and this sure strikes my taste buds as a contender! My husband has loved everything I’ve made from both DALS and Smit Kit sites. however, more telling than that is the fact that I got that salivary tingle when I saw the picture. I could smell the chops! Yum! That recipe has me feeling hungry again even though I’ve already had dinner tonight. Ooh I love smitten kitchen and can’t wait to check out the cookbook! I love sk especially for baking like you said. The brownies I make are from her blog. Amazing. Love both of your sites!! Would be so fun to win! The books looks gorgeous as well as the pork chops. What a fun giveaway!! I bought your book and would love to add this one to my slowly growing collection. I made Deb’s Whole Wheat Raspberry Ricotta Scones which were wonderful. I would love to win a copy of her cookbook to give as a gift. I would love a copy of this book. I always love a new cookbook especially if it has pictures in it! Thanks! the book looks amazing (and so do those pork chops)! This is making me drool. I’ll have to take a look at that cookbook. I have been admiring this book:) Thank you for the chance to win it. Both your book and the Smitten Kitchen book are on my Christmas wishlist. This cookbook is on my amazon wishlist! Am I too late!? Smitten Kitchen and DALS are my two go-to blogs when I’m inspiration-less (sadly, often these days). I also have some leftover apple cider in the fridge from a soup I made recently. It may have just been given a new destiny – pork glaze. Who wouldn’t want that sort of fate? DALS and Smitten Kitchen are the only blogs I read! I’m buying your book this holiday season for a couple of friends and family members. I don’t eat pork, but this looks awesome! I may have to make an exception! 🙂 Smitten Kitchen is awesome blog right along with yours! This looks delicious and I would love to add her cookbook to my collection! am here to vouch for the rugelach. oh, are they the best!